Joel Embiid has been telling Philadelphia 76ers fans and the NBA as a whole to ‘Trust The Process’ since joining the Sixers back in 2014, and if you trusted him along the way you’re looking like a pretty smart person right now. After winning a combined 38 games over the past two seasons, the Sixers closed out the 2017-18 regular season on a franchise record 16-game winning streak and clinched the third spot in the Eastern Conference. Although Embiid hasn’t played since March 28, he was on the bench to support his squad on Wednesday night and he was showing everyone a preview of what playoff Joel Embiid might look like and had a fantastic tweet to go with his new look. 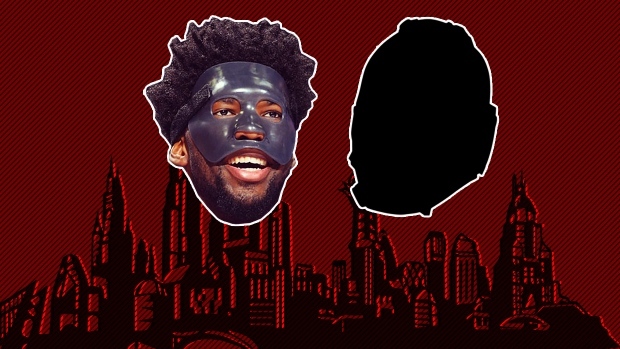 Embiid continues to show why he’s one of the best professional athletes on social media as he combined a photo of himself in his new face gear with a Bane quote from The Dark Knight Rises. The 23-year-old put up career-highs across the board this season as he averaged 22.9 points, 11 rebounds, 3.2 assists and 1.8 blocks per game in 63 starts this season and plans on being ready to go for the team’s first round matchup against the Miami Heat.